This parallel group, participant-blinded, randomized control trial evaluated the effectiveness of dry needling as a treatment for plantar heel pain. Eighty-four volunteer participants met the inclusion criteria: clinical diagnosis of plantar heel pain for 1 month or longer, report of first step pain of at least 2/10 the Visual Analog Scale (VAS), and no previous history of dry needling or acupuncture. The authors used this list of “essential criteria” to identify trigger point presence and location: “(1) a tender point within a taut band of skeletal muscle, (2) a characteristic pattern of referred pain, (3) patient recognition of pain on sustained compression over the tender point, and (4) a local twitch response (LTR) elicited on dry needling of the taut band.” Forty-one participants received real dry needling treatment and 43 participants received sham dry needling treatment. Each group received 1 intervention per week, 30 minutes in duration, for 6 weeks. Interventions were administered by a registered podiatrist with 4 years of dry needling experience. The sham needling procedure utilized a non- penetrating needle placed on the skin over the trigger point and manipulated in an “up and down motion” for 5 minutes prior to disposal of a real needle in a sharps container under participant observation. During the real dry needling procedure, needles were penetrated into the muscles where trigger points were thought to be and a twitch response was attempted to be elicited. Needles were left in place for 5 minutes. A sheet was positioned to blind the view of the needle “insertion” for both groups. Participants were followed for 12 weeks. Outcome measures of first step pain (measured on the VAS) and foot pain (measured on Foot Health Status Questionnaire) were statistically significant at both 6 and 12 weeks in favor of real dry needling, however the predetermined value for minimal important difference (MID) used in the sample size calculation was not exceeded. The authors concluded dry needling has “some beneficial effect” for plantar heel pain with only “mild and transitory” adverse effects experienced in some patients. The mechanism of action was discussed in a review of previous literature on dry needling and acupuncture. Proposed mechanisms reported by the authors include an increase in local blood flow, decreased levels of substance P, and central nervous system effects involving the descending pain system and subsequent endorphin release. Dry needling is now used by licensed physical therapists in several states. As of 2014, 25 states have affirmed that dry needling is within the scope of practice, 6 states have stated it is not, and 19 states have not yet reached a decision or issued an opinion (APTA, 2014). The practice is a topic of debate among health professionals and state regulatory boards are making decisions on the interpretation of the language within state practice acts. 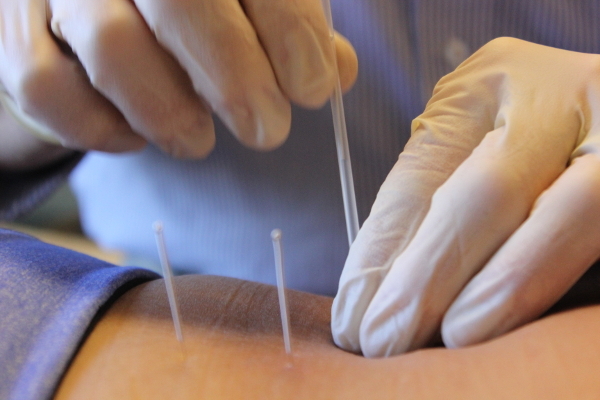 A question remains to be answered as to the primary mechanism of action of dry needling. Dry needling utilizes an acupuncture needle but differs from acupuncture in that it targets a trigger point within a muscle. The assumption is that the needle enters the three dimensional area of the trigger point, but it may be more accurate to claim the needle enters near a trigger point. A systematic review by Lucas et al, cited by Cotchett, reports that clinicians are reliable in determining whether a muscle has a trigger point, but are not reliable at determining the exact location. In addition, Lucas et al reports that there are no established valid diagnostic criteria for determining trigger point location. The “essential criteria” used by Crotchett, is referenced from a 1999 text by TravelI and Simons, and should be questioned for validity and reliability. It cannot be assumed that the needle is inserted into the precise trigger point location, yet pain is reported to decrease for some patients. It could be that the primary mechanism of action of dry needling and acupuncture is the “the placebo effect.” Cotchett et al report a study by Chae utilizing fMRI in which insertion of needles have been shown to activate brainstem nuclei such as the periaqueductal gray area, raphe nuclei, and locus coeruleus, which are involved in endorphin production and descending pain inhibition. Regardless of the mechanism of action, dry needling does help some patients. Patients with an open mind and a trusting relationship with their physical therapist may perceive the treatment as a unique option that can be used in addition to other skilled physical therapy interventions. It is interesting to note that this study’s sham dry needling could have had a potentially strong placebo effect or some other kind of mechanoreceptive effect and the dry needled group still had significantly better results. The ODNS courses sponsored by the IAOM-US give a well-rounded approach to the use of dry needling as an adjunct to a comprehensive approach to musculoskeletal pain. 1. Chae Y, Chang DS, Lee SH, et al. Inserting needles into the body: a meta-analysis of brain activity associated with acupuncture needle stimulation. / Pain. 2013:14:215- 222. 2. Lucas N, Macaskill P, Irwig L, et al. Reliability of physical examination for diagnosis of myofascial trigger points: a systematic review of the literature. Clin J Pain. 2009;25:80-89. 3. Physical Therapists &amp; The Performance of Dry Needling. (2012). APTA Department of Practice and APTA State Government Affairs. 4. Simons DG, Travell JG, Simons LS. Myofascial Pain and Dysfunction: The Trigger Point Manned, Vol 2: Lower Half o f the Body. 2nd ed. Baltimore, MD: Williams &amp; Wilkins; 1999.